Police headquarters, at the corner of Crescent St. and Ottawa Ave., showing the stone and brick facade probably in the original colors. The lower portion of the building, the front stairs, and the arches over the windows are of grey stone while the walls of the building are of buff colored brick. 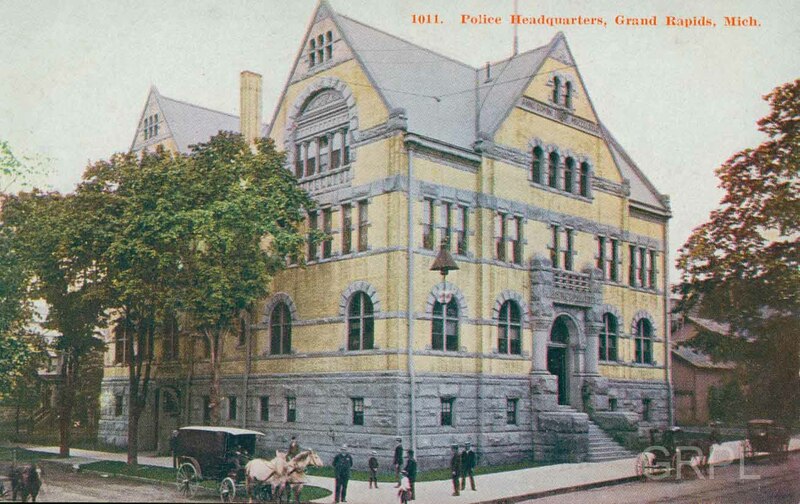 At the left of the card, toward the rear of the building, the arched doors of the horse entry can be seen. Several verticle downspouts are visible around the building. Horse-drawn carriages on parked on the street, and a street lamp of the period hangs over the intersection. Title from postcard. The building cost $40,000 to build and $6000 to furnish.